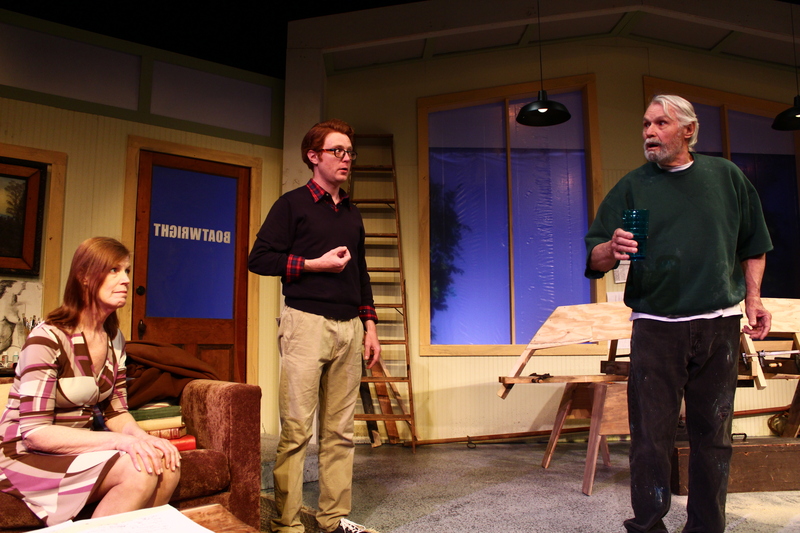 Elka Miller (center) Cassie Boblitt & Megan Serneels in East of the Sun. Photo: Scott Utterback with Courier Journal. 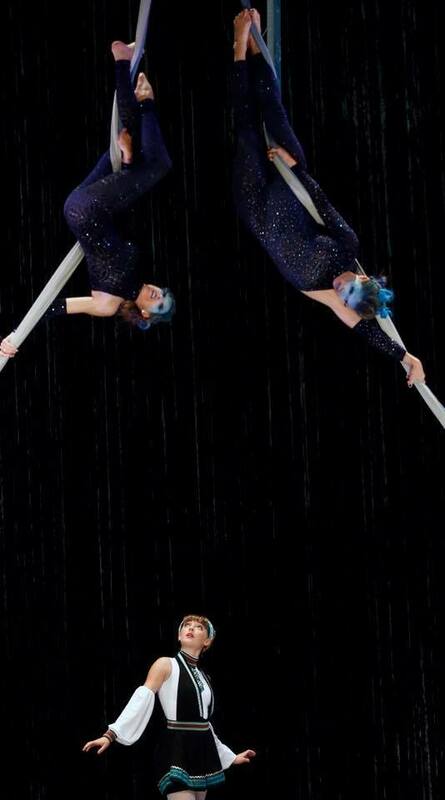 As the traditional circus format has faded more from view, the “cirque” idea has adopted a higher profile. Cirque de Soleil is an international juggernaut, a cross between dance and human acrobatics presented with a layer of glitzy showmanship, that occupies rare territory in the world of theatre. 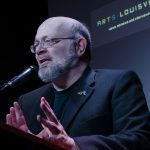 But more and more smaller, local companies have sprung up around the U.S. CirqueLouis brings this idea to Louisville, a fresh approach to narrative storytelling on a larger scale than most companies. East of the Sun is adapted from Norwegian folk tales, and the European context is a fine fit for the cirque aesthetic. The story tells of a girl named Rose (Elka Miller) who marries the White Bear (Jordan Clark) in exchange for wealth and security for her family. But the Bear is only a bear due to an enchantment, and Rose discovers him to be a handsome prince. Her discovery has violated the enchantment and he must travel to the troll’s castle, east of the sun and west of the moon, to marry a sister of the Troll Queen. Rose follows him, having several adventures along the way. The odyssey narrative is a durable and iconic form, and the production makes canny use of Rose’s encounters to communicate character and situation using cirque techniques: Rose’s revelation of the Bear’s secret to her mother and sister is expressed in a trio of sling performances, a classic bit of fairy tale business about a golden apple manifests itself in a walking globe routine during which two young girls nearly steal the moment from Elka Miller’s Rose, and the importance of a spinning wheel on her journey results in a spectacular turn from Jameson Peligro with the Cyr Wheel – imagine a wheel with a human body as the spokes. The details of the story are included in the program in a helpful scene-by-scene breakdown, and they are necessary. The emotion and texture of the piece are beautifully realized onstage, but a full understanding of the plot requires the synopsis. Rose’s mother’s belief that the White Bear is actually a troll, for example, is difficult, if not impossible to glean from the onstage action. Director Christine Moondancer gives the opening scenes a low-key quality, so that the first movements are a tad underwhelming. But she slowly builds the level of difficulty and complexity on the acrobatic activities to give the show momentum and an ever-increasing energy. The design work is exemplary, with magnificent costumes and sound design comprised of mostly instrumental songs that, given they were drawn from a variety of sources, were surprisingly consistent in their effect. All of this was accomplished by Ms. Moondancer, who gives new meaning to the term “multi-hyphenate.” She does allow Jordan Clark to lend some splendid choreography,although where his choreography ends and the individual performers’ acrobatic movements begin is difficult to discern, which seems right. The stage movements are simple and graceful, with enough classical flourishes to position East of the Sun securely in Nutcracker and Swan Lake territory. Mr. Clark also plays the White Bear, and is every inch the dreamily handsome prince fairy tale expectations require. Elka Miller brings an appropriate wide-eyed innocence to Rose, and a remarkable agility in the use of more apparatus than any other single performer in the show. At one point she glides effortlessly around the stage on a device hidden beneath a fulsome skirt, and the image exemplifies the overall confidence of the production, as well as the flow of the movements. Act 2 opened with a sequence of the winds, East (Jessica Marquardt), West (Cedric Dedina), South (Courtney Markham & Carter Webb), and North (Lynley Elliott, Leighann Pusateri, Laura Shahan, & Abbie Springer) that built to a breathtaking performance in the silks by the North quartet that upped the ante on perceived risk. By the time Rose has come to the Troll Queen’s castle, the stage is filled with comically grotesque figures that include a half dozen giants from Squallis Puppeteers. Ms. Moondancer’s fine sense of balance and proportion in staging fills the stage without courting chaos, and positions an elegant pas de deux between the prince and Rose on the Lyra as the emotional climax of the story. In truth, there are occasional moments where the action stops the narrative for the sake of allowing a bravura moment. When juggler Lee Mai follows an adept routine by balancing a large tree branch prop on his chin, it justifiably earns a hearty round of applause, but its importance to the story is questionable. And the need for stagehands to enter scenes to secure equipment before it can be hoisted out of the way is an unfortunate breaking of the spell. But I don’t wish to be churlish. The skills of the cast, which include several younger performers, are impressive, and East of the Sun balances that unbridled ability with charm and showmanship enough to win a standing ovation from an audience of several hundred.